You don't come to eBay to spend time shipping. That's why UPS does more - like integrating shipment processing with eBay - to help you save time, and get back to the fun stuff. Sign up only takes two minutes and costs nothing. All you need is a UPS account number and a PayPal account. Don't have a PayPal or UPS account? You can open either one at the same time as you sign up for UPS savings** It's easy and fast. I'm ready to start saving** on UPS Shipping! Note: You will be directed to the PayPal Shipping Information page. Under UPS Information, choose Add a new or existing UPS account and you will automatically be enrolled. For more details and answers to frequently asked questions, please see the FAQs. If you already are using PayPal Shipping for UPS: When you have packages ready to ship, you can create a label by clicking on the Print Shipping Label button in My eBay. You will have the opportunity to sign up for the UPS Special Pricing Program for eBay Sellers. 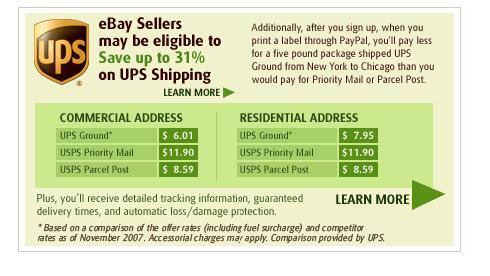 Please note rates for the UPS Special Pricing Program for eBay Sellers take a few days to become effective. Four to six business days after you enroll in the program, you will receive an email with your enrollment status and the date any new rates will begin. Offer is available to US-based accounts (excluding AK and HI) for US domestic and international shipments. The UPS Special Pricing Program for eBay Sellers is brought to you by UPS and is available for packages processed on eBay or PayPal. Please refer to the program FAQs and enrollment confirmation email for details regarding when these rates would take effect for you. UPS, the UPS brandmark, and the Color Brown are trademarks of United Parcel Service of America, Inc. All Rights Reserved.